The Roman occupation of Provence lasted six centuries, beginning more than one hundred years before the birth of Christ, and surviving until well after most of Europe had become Christian. Today the region remains richer in Roman monuments than anywhere in the world. They are everywhere you look, from vast amphitheatres and triumphal arches to paved road and aqueducts which bestride the countryside. Two thousand years later, the Roman genius for engineering still astonishes.Provence owes its name to Julius Caesar who described the region as ‘the Province of Rome’. It was then a much larger area, stretching westwards to include Languedoc and Roussillon as far as the Pyrenees, eastward to the Riviera and the Maritimes Alps, and northwards up the Rhone Valley as far as Lyon. 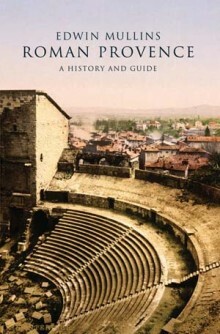 This book covers much of that larger area while concentrating on the area of present-day Provence and neighbouring Languedoc, the heartlands of the former Roman colony.Edwin Mullins seeks out hidden traces of that ancient world along with the many spectacular monuments that today adorn the cities of Nimes, Arles, Vienne and Orange. He tells the story of how the Romans came to invade Provence, how they stayed to colonize it and how they transformed Provencal cities into imitations of Rome. His narrative also tells how the Emperor Constantine brought about the conversion of the Roman Empire to Christianity from his favourite city of Arles-and how the Romans were eventually driven out by the Visigoths. Roman Provence is also a guide to the principal sites in the region as well as those rarely visited, with separate chapters on various Roman achievements: triumphal arches, aqueducts, farming, city life, bridges and road-building, temples and shrines, theatres and amphitheatres. A further section considers the aftermath of Roman rule, the restoration of ancient ruins and the debt we owe to those remarkable engineers who inspired the first great achievement in medieval church architecture known, appropriately, as ‘Romanesque’. Edwin Mullins is a writer, journalist and film-maker. Formerly art critic of The Sunday Telegraph , he has written widely on the visual arts and on medieval history and architecture. His books include The Pilgrimage to Santiago , Avignon of the Popes, The Camargue and the award-winning In Search of Cluny: God’s Lost Empire, all published by Signal.